Corvette Summer, The most famous Corvette's ever known! Mark Hamill, Luke Skywalker stared in the 1978 movie Corvette Summer with his co-star Annie Potts. This is a left hand drive replica, the actual car was RHD but unsafe for our use to recreate. The car is a labor of love and completely repainted to it's correct custom red flamed metal flake paint job exactly how it was done in 78. The rear bow-tie rear end and flares also recreated. The exhaust exits correctly and is exact as the film and was over 8k to recreate. Photos and videos of this car have been shared around the world. The correct wheels and tires were sourced out along with the the correct transparent T tops. It has a 350 engine with a mild cam and automatic transmission with very little use as it is primarily in our mini museum and transported to charity events. The car has new tires, brakes, Gabriel shocks front and rear air shocks. It has the Mickey Thompson valve covers that are hand painted matching the movie and correct air cleaner intake. The fog lights are impossible to find and are screen accurate along with the rear fuel racing filler door. The Nevada plate was recreated to match when the bad guys stole it and painted it gold. Clean California title and has no issues. Serious inquiries only. 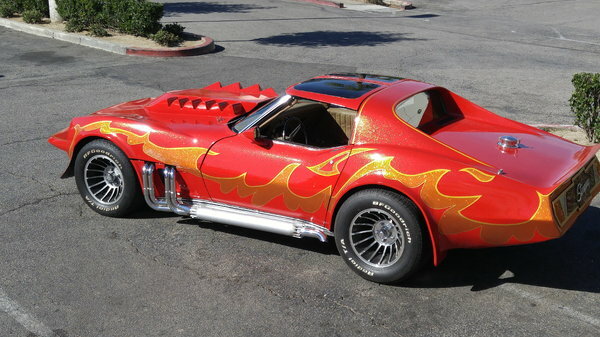 This car is one of the hottest Vettes on the West Coast!! Please no BS and we don't need help selling it.